A popular stereotype of Americans traveling abroad is the tourist who is at a loss when it comes to coping with any language other than English. Fair or not, the fact is that while the U.S. does not have a national requirement for students to learn a foreign language in school, the typical European pupil must study multiple languages in the classroom before becoming a teen. 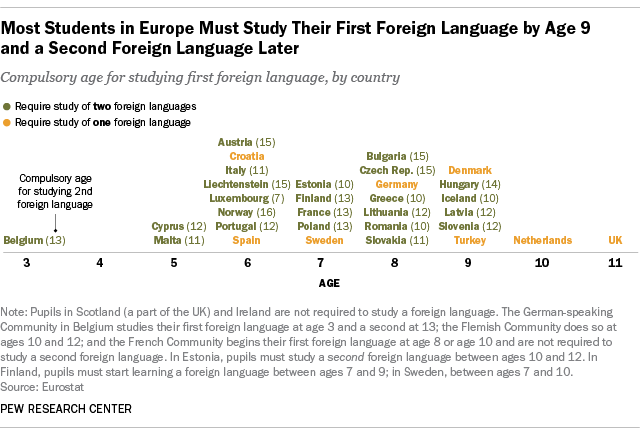 Studying a second foreign language for at least one year is compulsory in more than 20 European countries. In most European countries, students begin studying their first foreign language as a compulsory school subject between the ages of 6 and 9, according to a 2012 report from Eurostat, the statistics arm of the European Commission. This varies by country and sometimes within a country, with the German-speaking Community of Belgium – one of the three federal communities of Belgium– starting its 3-year-olds on a foreign language, but parts of the United Kingdom (excluding Scotland) waiting until age 11. Ireland and Scotland are two exceptions that do not have compulsory language requirements, but Irish students learn both English and Gaelic (neither is considered a foreign language); Scottish schools are still obligated to offer at least one foreign-language option to all students ages 10-18. 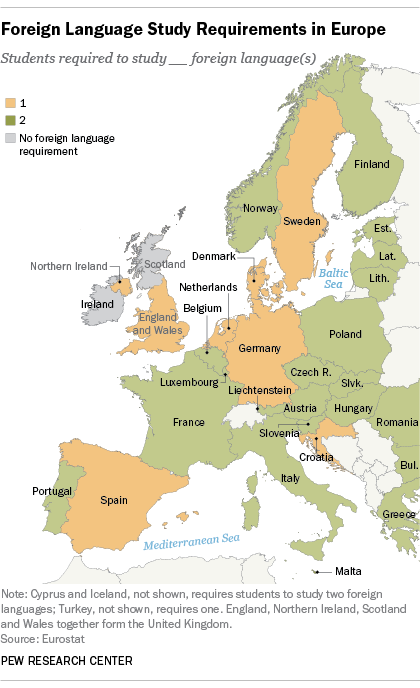 English is the most-studied foreign language across almost all European countries and at all education levels. Fully 73% of primary students in Europe and more than nine-in-ten secondary students were learning English at school in 2009-10, the most recent years with available data. Although some countries mandate that students learn English as their foreign language, the portion of pupils studying it remains high across the board, even in countries without this rule. French and German were the next-most popular languages in most countries, with Spanish and Russian also widely taught as foreign languages in certain regions of the continent. The percentage of students learning some other language was below 5% in most countries. Meanwhile, the U.S. does not have a nationwide foreign-language mandate at any level of education. Many states allow individual school districts to set language requirements for high school graduation, and primary schools have very low rates of even offering foreign-language course work. Some foreign-language learning standards can be met by taking non-language classes. For example, California requires one course in either the arts or a foreign language (including American Sign Language) for all high school students. Oklahomans can opt to take two years of the same foreign language or “of computer technology approved for college admission requirements.” Conversely, New Jersey students must earn “at least five credits in world languages” or demonstrate proficiency in a language other than English before they can graduate high school.